Elasund? The Little settlement on the coast? Well, those days are long gone. Elasund is now growing rapidly and more and more Catanians are streaming into the city, eager to make their fortune! You have just been appointed to help the city expand. Now you will drive the city's growth and prosperity forward. You have already hired workers and acquired building materials. What will your next building project be? And, just as important, where will it be? You are not the only developer in town, so you will need to be savvy and resourseful. Your competition is eager to out perform ou and claim all the credit! Fortunately, you'll get the hang of this business quickly. Despite having limited resources early on you have enough gold to construct your first few small buildings. Your influential connections will provide you with all the necessary building permits. In Elasund, nothing is constructed without building permits! Once a building is constructed, it can start generating gold or influence for your use. Soon this flow of materials will allow you to start going after bigger projects! You may even become involved in the construction of the town cuurch of the city walls. But beware of your competitors! They may try to leverage their way into your neighborhood with their own permits! If you don't watch them closley enough, they might even attempt a hostile takeover of you buildings! Will you emerge as Elasund's most influential city developer? 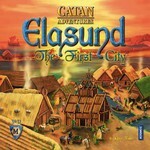 Find out in this new Catan Adventure!